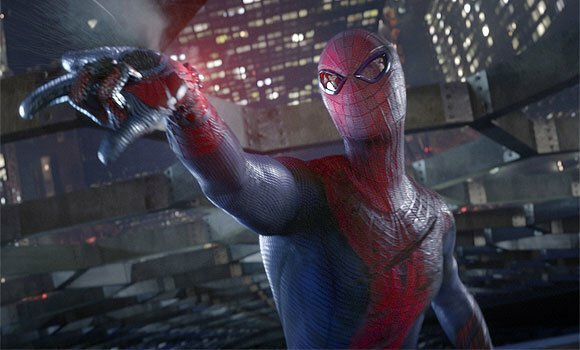 An understandable shockwave of geek-rage exploded in early 2010 when Sony Pictures, amidst rumours of cost-cutting and ongoing arguments over creative direction, scrapped series helmer Sam Raimi’s gestating Spider-Man 4 in favour of a full-on reboot. After all, while 2007’s Spider-Man 3 was a somewhat messy (studio-compromised) disappointment, the film still earned a robust $890 million dollars worldwide and ended on an emotional cliffhanger. Starting over from scratch meant audiences would never witness the ultimate resolution to the rocky romance between Tobey Maguire’s web-slinging Peter Parker and Kirsten Dunst’s fledgling actress Mary Jane Watson. Could any rejiggered origin story, no matter how good, justify such an extreme shake up? Unfortunately, the end result of this decision, director Marc Webb’s The Amazing Spider-Man, is a pretty lackluster alternative to the heartfelt, bubble-gum-infused joys that Raimi so deliriously wrought. Dressed up in an ill-fitting costume of angsty quasi-realism, it’s a wonderfully cast, meandering and unconfident mixed bag of a superhero extravaganza that follows many of the same beats as its predecessor, with merely a fraction of its high-flying energy. Amazing? Hardly. Inoffensive? Sure. Underwhelming? No doubt about it. Unlike Maguire’s lovably awkward, cheery-eyed nerd, this latest Peter Parker is a moody, gutsy teenage loner with a chip on his shoulder and a skateboard always in hand. Haunted by the mysterious disappearance of his parents (Campbell Scott and Embeth Davidtz), and solitarily prowling the high school halls, he nonetheless yearns to someday catch the eye of Gwen Stacy (Emma Stone), a brainy blonde beauty with serious skills in the science department. 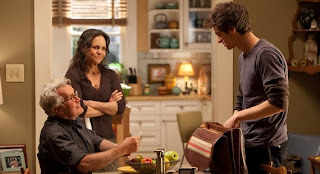 One evening, exploring the basement of the home he shares with his kindly Aunt May and Uncle Ben (Sally Field and Martin Sheen), he happens upon his scientist father’s briefcase, which contains valuable, and enigmatic, research. Following a string of clues to Oscorp Industries – which, like most high profile biotech firms, hires high school interns – he encounters his dad’s former partner, Dr. Curt Connors (Rhys Ifans), a one-armed biologist researching reptilian regeneration, and has a life-changing date with spider-bitten destiny. Of course, as the Spider-Man mythos demands, just as Parker is getting used to his newfound abilities, and building some snazzy mechanical web-shooters, one selfish decision leads to Uncle Ben meeting a classic Uncle Ben-ian fate. Driven by grief and rage, the unrefined crusader begins a single-minded vigilante quest to catch the crook responsible for his loss, much to the annoyance of Gwen’s NYPD captain pop George Stacy (Denis Leary). However, just as his crime-fighting career is starting to warm up, Dr. Connors, suffering immense inter-office pressure, tests his experimental serum on himself, with disastrously scaly consequences. The filmmakers have purposefully named their movie after ‘ol Webhead’s flagship Marvel Comics series, yet the more appropriate choice would have been “Spider-Man’s Tangled Web,” as this movie boasts one hopelessly confused narrative. The picture, credited to three writers – James Vanderbilt (Zodiac), Alvin Sargent (Spider-Man 2 & 3) and Steve Kloves (the Harry Potter franchise) – gracelessly unfolds like it was cobbled together in the editing room from mismatching parts. The Amazing Spider-Man has an uncanny aptitude for leapfrogging from plotline to plotline, rarely paying off any. Peter’s investigation into his father’s past? Forgotten. The same goes for his hunt for his uncle’s killer, ongoing conflict with grieving Aunt May (Field is wasted in a nonentity role) and apprenticeship under Dr. Connors. And the shady dealings of Oscorp president Norman Osborn’s lackey (Irrfan Khan)? Wait for the already announced sequel in 2014, I guess. Whereas the 2002 film picked which points to hit and boldly carried them to their logical conclusion, Webb and his team try to cram in every possible idea, simultaneously making their bumpily paced 136 minute movie feel both bloated and too short. There’s no flow to it’s hero’s journey, only scattered checklist moments and prologue material for future entries. Even the effective and engaging elements, such as the central courtship and the rivalry between Peter and Captain Stacy, are dilluted by all the surrounding filler. That said, these nagging story problems become infinitely less egregious once the villainous Lizard rears his ugly head. Aggressively contradicting the realistic world the picture has established (imagine Batman Begins with The Incredible Hulk’s Abomination as the central baddie), he’s a tonally jarring all-CG creature with a sinister scheme straight out of the first X-Men movie. Never mind that he’s basically just a one-dimensional, toothier clone of Green Goblin – a tragic father figure scientist who falls victim to his own experimental injection and becomes a split-personality green menace – stripped of his touchingly tragic comic-book backstory. No, Lizard’s greatest sin is that his appearance sends The Amazing Spider-Man careening off the rails into cornball C-grade horror movie land. In a project fraught with issues, his clunky, tail-whipping presence is irredeemably disruptive. Although he’s at a loss when it comes to wrangling his film’s cartoonish antagonist, director Marc Webb still manages to inject enough charm, if not personality, into the proceedings to pull it back from disaster-land. As evidenced by his debut (500) Days of Summer, he has a clear understanding of how to stage an honest youthful love tale, and, in the relationship between Peter and Gwen, he strikes a pleasantly authentic, sweet vibe. Webb doesn’t aim for big iconic moments – no upside down kisses or, despite a nice set-up, late night swings through the city – choosing instead to capture the witty, earnest intimacy of the union. It works. 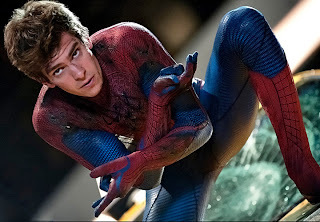 He also scores on a number of comedic sequences showcasing Spidey’s developing powers, and finds interesting ways to present the character’s unusual poses and approaches to battle. 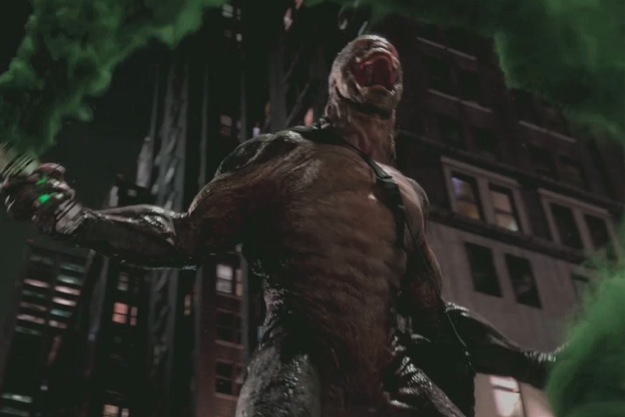 Even if the downbeat tone of the film prevents the action setpieces from being particularly exhilirating or awe-inspiring, the helmer understands effects and knows how to stage a cool moment, such as when our hero tracks Lizard in the sewer by creating a large vibration-sensitive web network. A schmaltzy climactic post-9/11 “New Yorkers united!” scene involving helpful cranes is a bit much, however. The one area where The Amazing Spider-Man truly excells is in its casting. Garfield isn’t inhabiting a Peter Parker that I’m personally familiar with, but he’s an appealing, physically spot-on presence, easily carrying the unwieldy film on his wiry shoulders. He makes you long to see what he could do with better material. Likewise, Stone – who can do no wrong these days, it seems – vibrantly humanizes Gwen and gives her a spunky can-do spirit. Capable and smart, she’s a heroine who doesn’t fall victim to the usual weary cardboard conventions reserved for superhero love interests. Of the supporting players, on-screen patriarchs Leary and Sheen are the stand-outs. The former, more vinegary than the Captain Stacy of the comic books, is a very fun, imposingly snarky sparring partner for Parker (J. Jonah Jamieson is MIA here), while Sheen, like Cliff Robertson before him, makes Uncle Ben impossibly dignified, warm and sadly unforgettable. As the cursed Dr. Connors, Ifans has a nice academic dryness. It’s too bad he really just gets to give a half performance before the soulless 1s and 0s take over. If only this well-acted, technically competent endeavour didn’t feel so unnecessary and fundamentally empty at its core. Compared to the first two Raimi films, which were perceptibly fuelled by delighted adoration for our Friendly Neighbourhood Wallcrawler, this picture feels like a calculated, dutiful business move with only slightly diverting diminished returns. The Amazing Spider-Man more or less gets to where it wants to go, but its too reigned in and rickety to cut loose and soar to perilous new unseen heights.